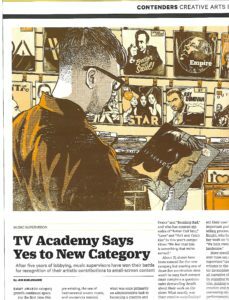 To launch this season’s Variety coverage of the Emmy race in the music categories, I talked with a TV Academy governor and five music supervisors who may be possible nominees (for such diverse series as Halt & Catch Fire, Outsiders, Empire, Star, 13 Reasons Why and Ray Donovan) in the new category of Outstanding Music Supervision. Voters will judge these shows on the best use of songs (both original and licensed) in their dramatic contexts. For a second story about this year’s scores and songs, I interviewed the composers and songwriters of four of the season’s most talked-about TV shows: The Crown, Feud and Stranger Things and, for songs, that musical episode of The Flash. This entry was posted in Composers, Interviews, Television Music and tagged 13 Reasons Why, Emmy, Empire, Feud, Halt & Catch Fire, music supervision, Music Supervision category, original scores, original songs, Star, Stranger Things, The Flash, TV music, Variety on June 2, 2017 by Jon Burlingame.